Receive $4 off the MVP Experience. You must present Employee ID/Membership Card. * This offer cannot be combined with other discount offers or specials. Valid at Any of or 40+ locations. Sport Clips has 40+ convenient locations in the greater Phoenix, Tucson, Lake Havasu, Kingman, Flagstaff, Prescott Valley, Prescott and Yuma. Check out our website www.sportclips.com to find a location near you. Sport Clips is America’s haircut place for men and boys. For the ultimate MVP Haircut Experience, visit one of Arizona’s 50 convenient Sport Clips locations. Our Clients receive a haircut from stylists who know men’s hairstyles – From the classic haircut to cutting edge, we have the expertise and experience to create the perfect look for you. 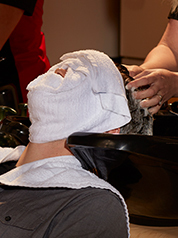 The MVP Experience includes a precision haircut, legendary hot steamed towel, massaging shampoo and relaxing neck and shoulder treatment – all this in a relaxing sports themed environment with TV’s tuned to sports at every station. No appointments ever and walk-ins are welcome! And keep your scruff neat and in line with our beard trimming and detailing service. We also provide free neck trims between visits and will keep you looking great with American Crew®, Paul Mitchell® Tea Tree, Nioxin® and Gibs™ Beard and grooming products. 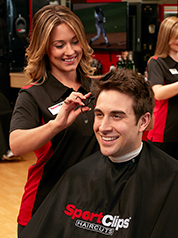 Visit Sport Clips today – and enjoy a mini Man Break. Sport Clips is passionate about supporting our nation’s active duty service members and veterans and is the “Official Haircutter” of the Veterans of Foreign Wars (VFW). Ask for the Ultimate MVP Experience!